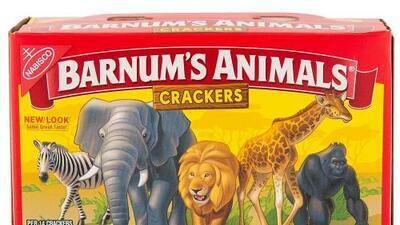 After about 116 years, Animal Crackers have been showing animals in a train style circus cage. The group People for the Ethical Treatment of Animals or better known as PETA have been putting pressure on the cookie company to change the packaging so the animals are roaming free. In 2016, PETA had wrote a letter to the parent company, Mondelez International who owns Nabisco to redesign the packaging for the popular treat. In the letter, PETA advised the company "Given the egregious cruelty inherent in circuses that use animals and public's swelling opposition to the exploration of animals used for entertainment, we urge Nabisco to update its packaging in order to show the animals who are free to roam in their natural habitats." The company now has released the packaging redesign showing the animals roaming freely. PETA wrote on social media thanking Nabisco for the positive change.